To Francesca, art has the same importance as philosophy: its ultimate purpose is to provoke something in the viewer of its time. 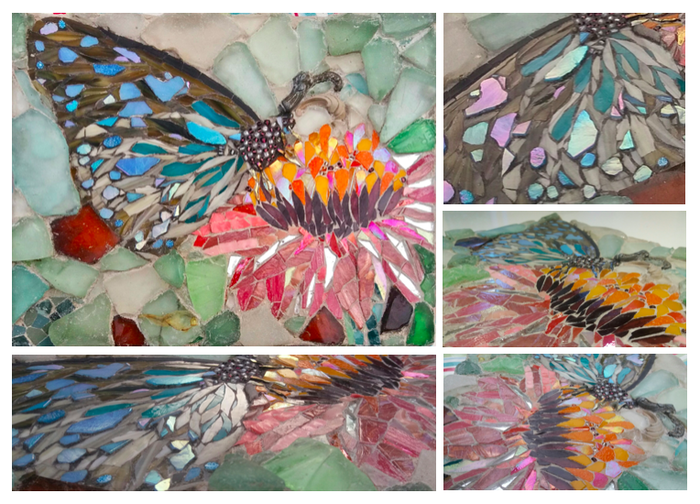 She feels a compelling urge to convey a message to the viewer, whether a thought or a pure emotion, as strongly as her technical and creative capabilities will allow. Torn between optimism and surrender, Francesca is haunted by the idea of mankind’s imminent self-destruction. 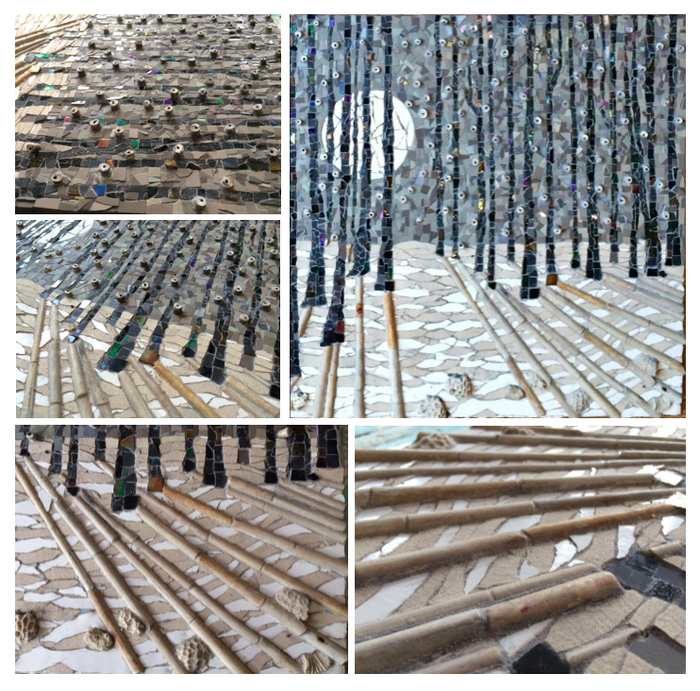 Yet, she believes in a future for humanity of resourceful innovation through reusing, recycling and upcycling. 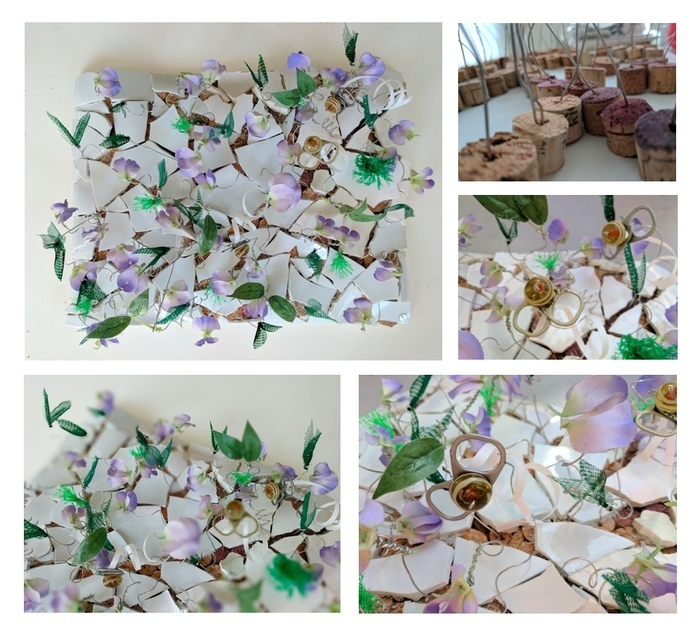 She is fascinated by colours and textures of both artificial and natural elements, which she hunts for in everyday life and plays with in new combinations, pairing and contrasting noble material with rubbish. 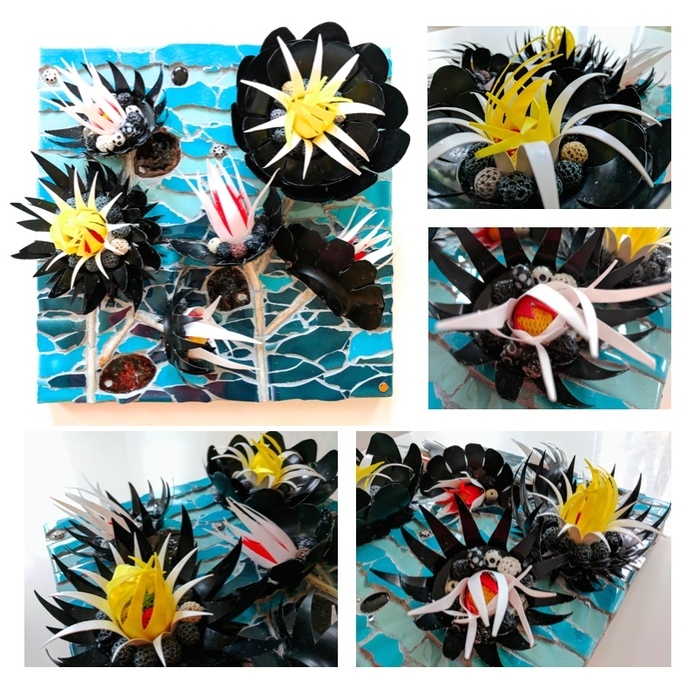 Her aim is to prove how rubbish is a relative definition and how it can be turned into something useful, fun and even beautiful. She thoroughly enjoys working within the material limitations which this choice entails. 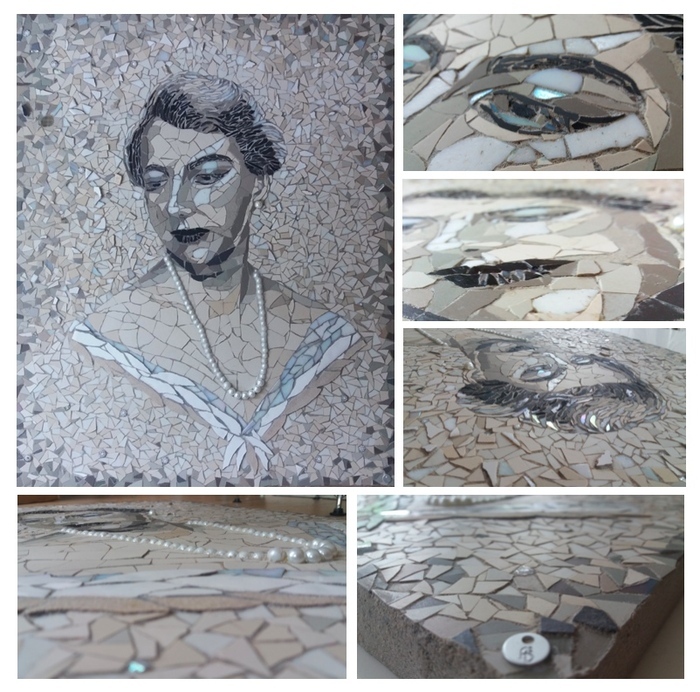 She has a true passion for mosaic, as it allows the use materials of all sorts: she strives to show the beauty and significance of each material uses, in each tiny piece. She never stops learning and experimenting. 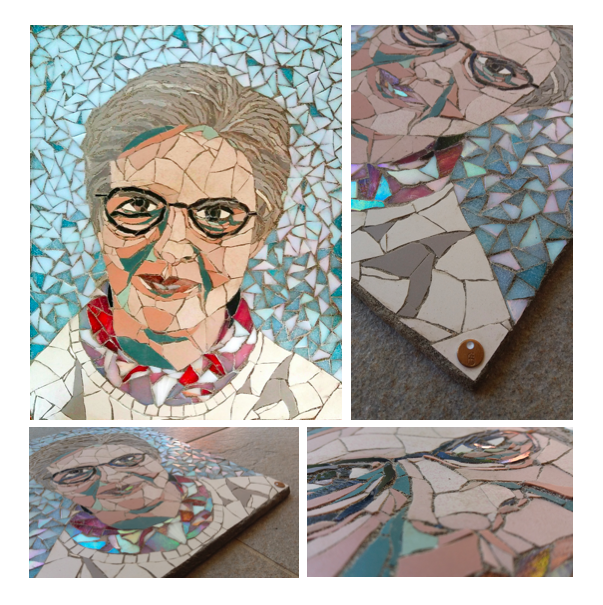 She is on a mission to show the incredible - yet still quite unknown - potential of modern mosaic, as a fine art in its own right. In her early life Francesca challenged herself by focusing on things that did not come naturally to her (e.g. going into Law after Classics). Yet, she tried for years to placate her internal restlessness by living in different countries and cultures (Pordenone, Padua, Denver, London, Paris, New York...); When she reached 40, with the responsibility of a mother, she settled between London and Trieste and found her outlet in what she liked and did best, namely using her hands to create. Art exhibitions, painting, scuplting and modelling clay were regular hobbies which never satiated her inherent creative nature. 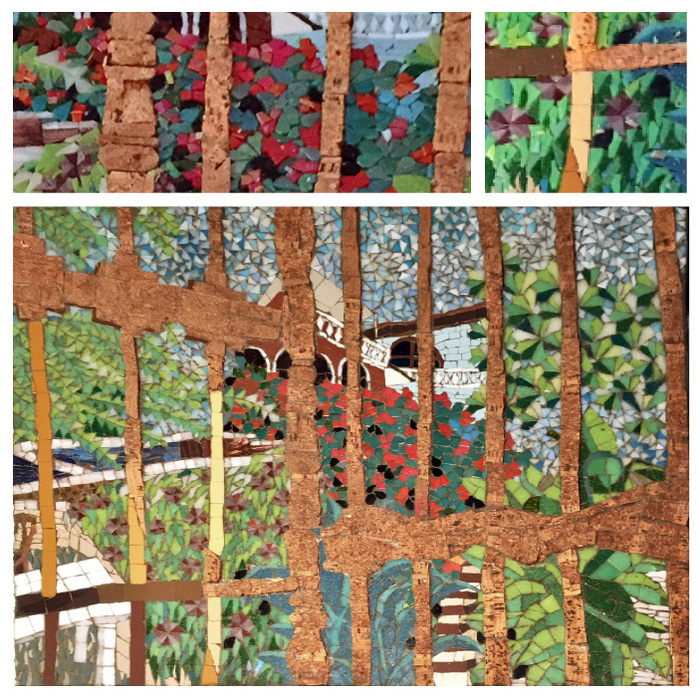 Finally one day, she entered the Scuola Mosaicisti del Friuli, in Spilimbergo: a whole new world of WONDERS opened up. 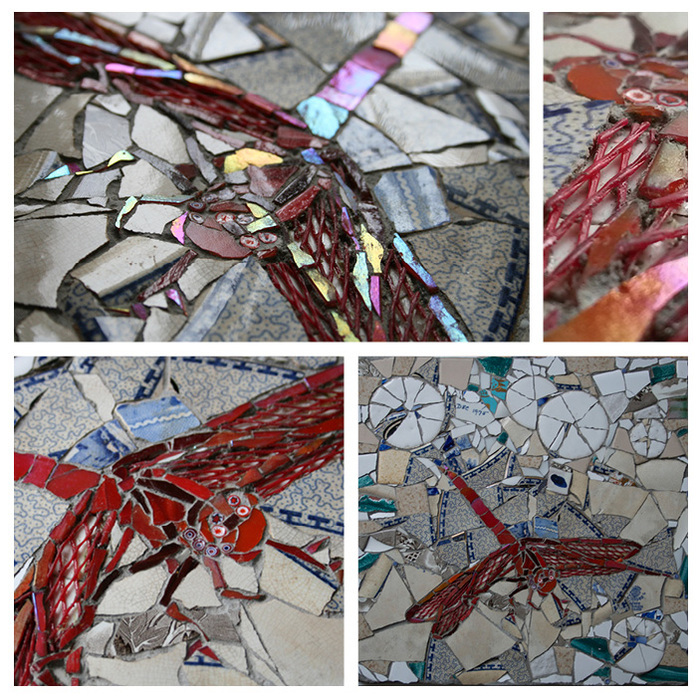 She found a delightful place in London, Southbank Mosaics, where she did a first Award course and a Level 2 Certificate. 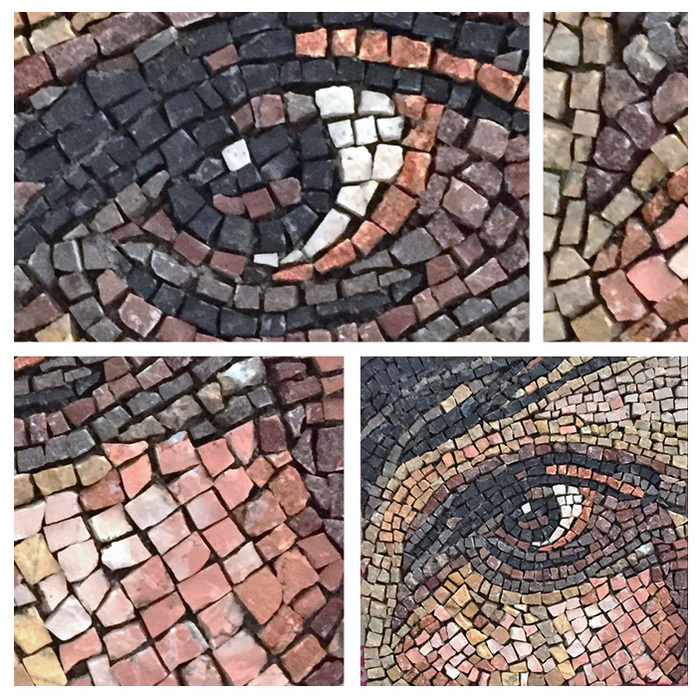 She also attends various courses per year in Spilimbergo (Roman, Bizantine and mainly Modern mosaic) and elsewhere. 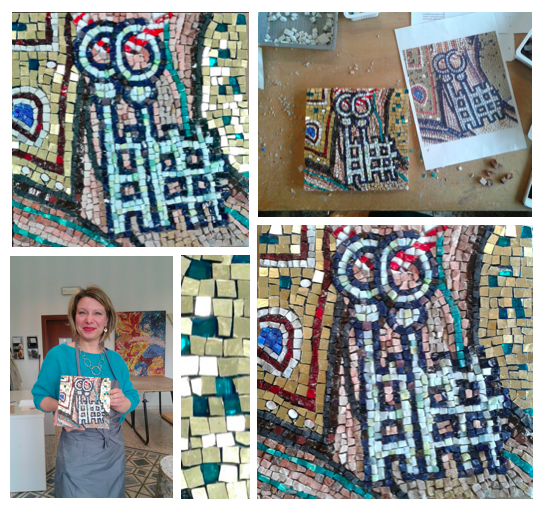 She’s looking forward to starting a Degree at the London School of Mosaic, opening in October 2017, where she has also been asked to teach short courses as a guest teacher. 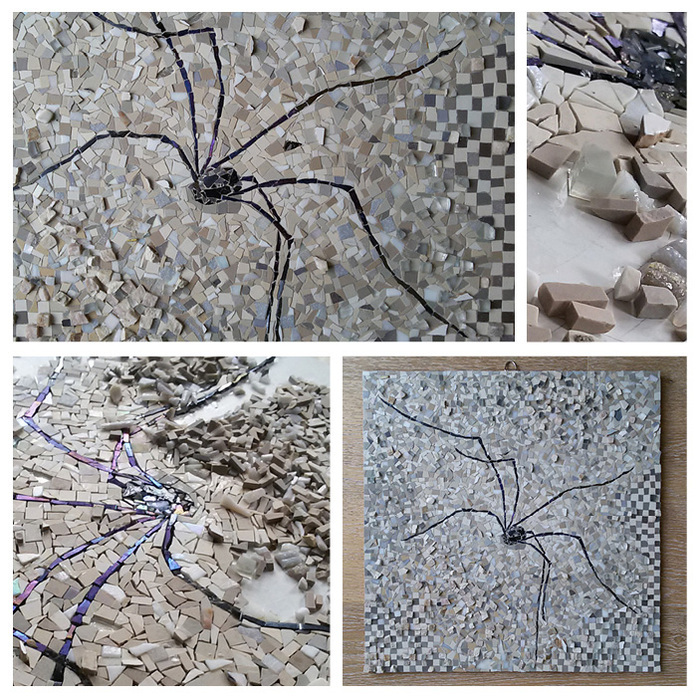 She has recently joined the Committe of the British Association of Modern Mosaic (BAMM) as Exhibition Coordinator, The Artists’ Pool as a member and is in the process of forming a collective with the fellow Artists in Residence at the Canary Wharf New District Residency in London (22 Aug - 29 Sept 2017). - "We Need to Talk about Clothes", Hardwick Gallery, Cheltenham, 22-26 April 17! "Gabriela", 2016. 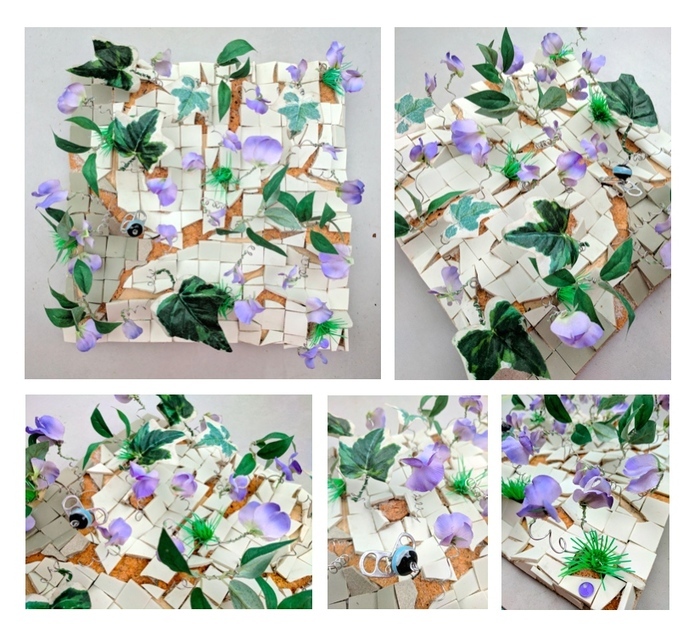 Marble, glass, ceramic on wood, direct method (50x50cm). 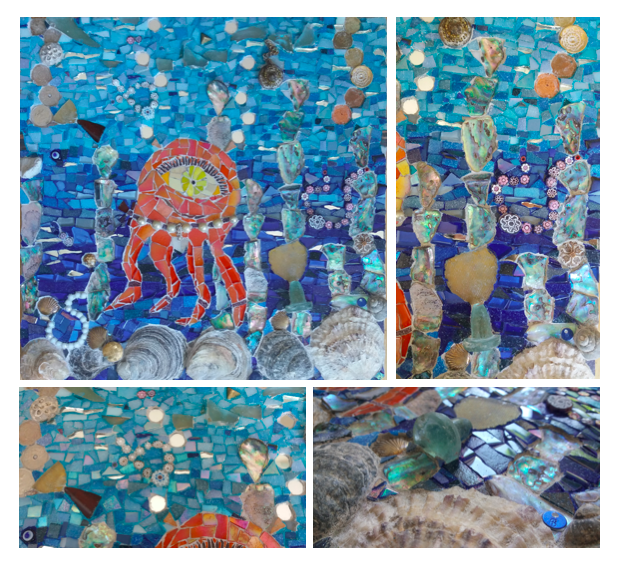 Playing with depth, colour and size of tiles to express the depth of the piece. 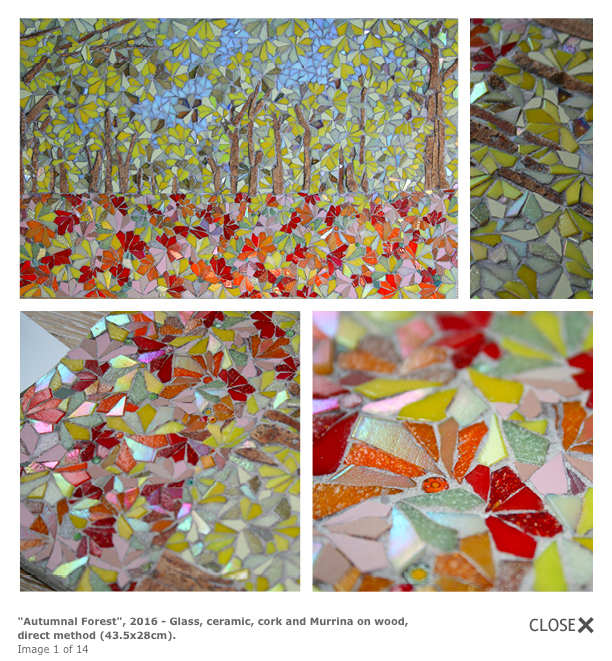 "Autumnal Forest", 2016 - Glass, ceramic, cork and Murrina on wood, direct method (43.5x28cm). Playing with the repetition of pieces of the same shape. 2016. Drawing by Ettore (5). 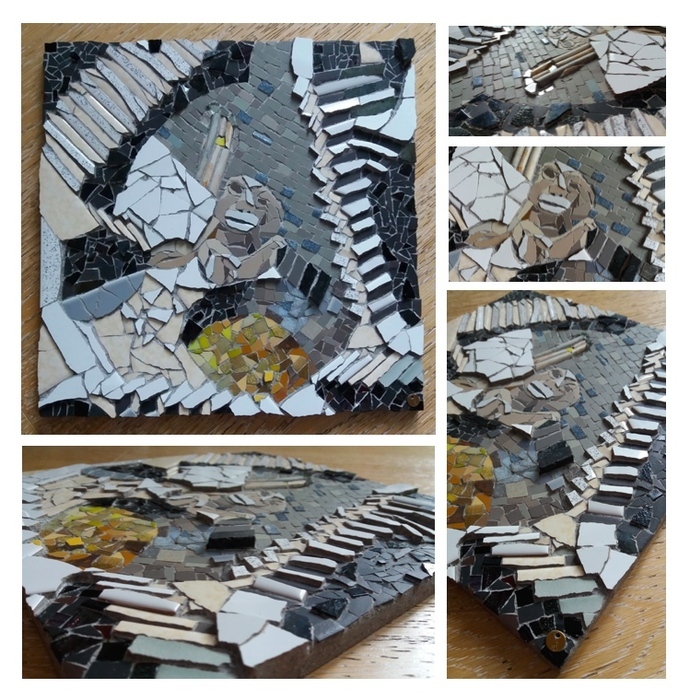 Ceramic, mirror and glass on wooden board, direct method (37x37cm). 2016. Drawing by Camilla (7). 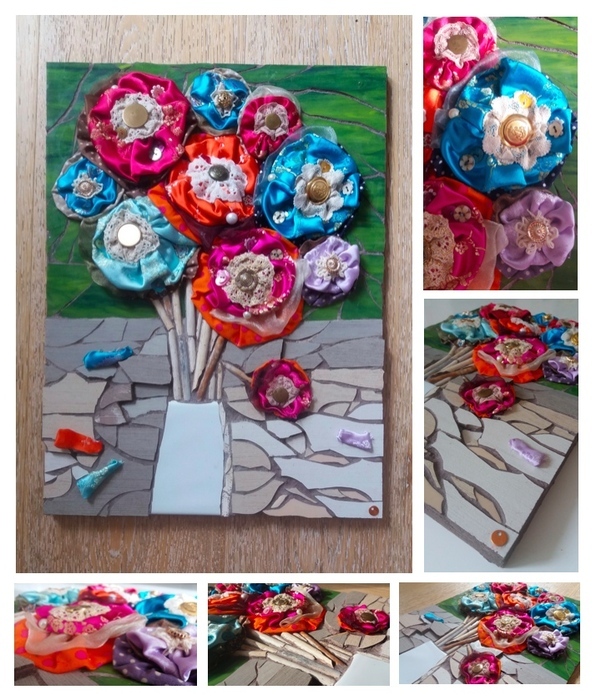 Ceramic, metal, millefiori, shells, pearls, buttons, coins, mirror and glass on wooden board, direct method (37x37cm). 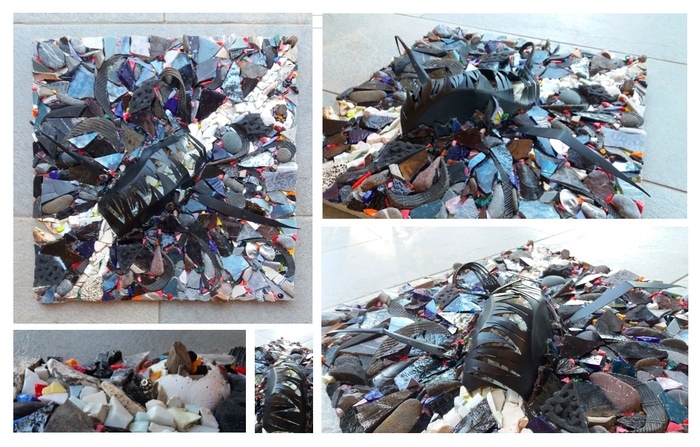 Marble, smalti, pebbles, wood, glass, metal, sponge and cement on wooden board, direct method on mesh (108x56cm). Hammer & hardie. Whilst visiting the Macalube of Aragona, in Sicily, I was struck by the odd feeling of walking on a lunar landscape: a post-apocalyptic scenery where no-one survived - yet where fresh clay was springing out as a sign that the world was still alive and on the verge of a new dawn. 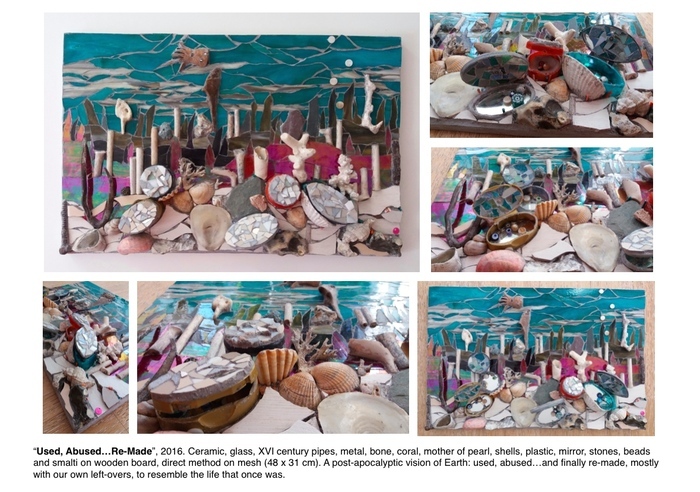 2016: bark, stones, pebbles, marble, smalti, millefiori (murrina), shells, ceramic, metal, wood, bone, acorns, sponge, XVI century pipes (from the river Thames), cork, chestnut shell, crab, glass, peach stone, slate, plastic and cement on wooden board, direct method (partly on mesh) (56 x 39.5 cm). 98% recycled material. What's left of a TV, an apocalyptic scenery behind it: we so cared about trivial things (such as being on TV) that we forgot to save ourselves from extinction. And yes, even more so now, we so wanted to BE in there…! 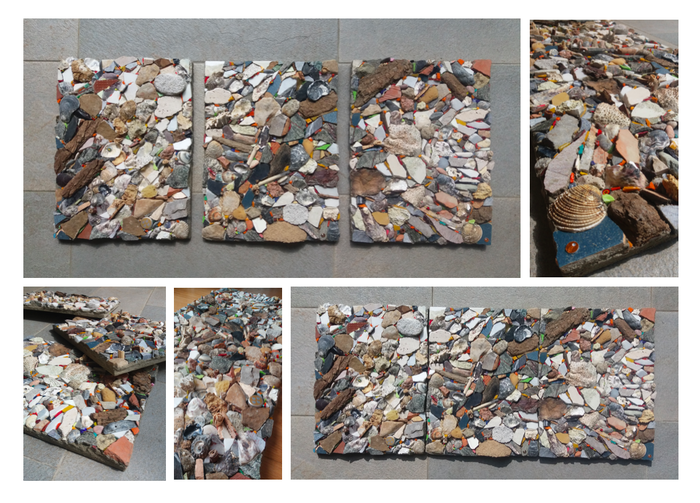 “MATERIA 1, 2, 3”, 2016: bark, stones, pebbles, shells, marble, smalti, metal, millefiori, sponge, glass, wood, XVI century pipes (from the river Thames), cork and wood on plywood, direct method on mesh, tryptic (30x40cm each).? 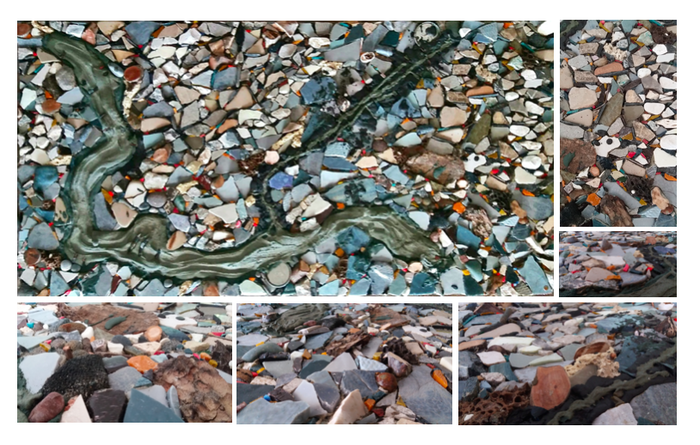 The natural elements are mixed with both rubbish and specs of millefiori and noble smalti, used sparingly to witness their precious nature as a material which, albeit used lusciously in the past, will be increasingly hard to find: for example, the production of reds and oranges is likely to cease in Italy (and eventually everywhere) in February 2017, as the use of one of their essential elements, cadmium, is highly polluting and will be banned. 2016. 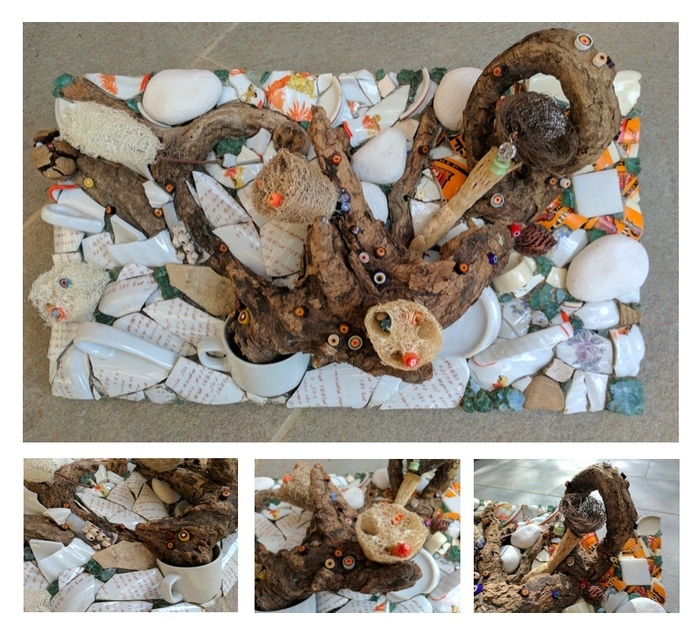 Ceramic, glass, XVI century pipes, metal, bone, coral, mother of pearl, shells, plastic, mirror, stones, beads and smalti on wooden board, direct method (partly on mesh) (48 x 31 cm). A post-apocalyptic vision of Earth: used, abused…and finally re-made, mostly with our own left-overs, to resemble the life that once was. "Past Perfect", 2016. Ceramic and glass on wood, direct method (30.5x23cm). Donated for a fundraising Gala at the Italian Embassy in favour of La Scuola Italiana a Londra. "Purple", 2016. Ceramic and glass on thin board, direct method (20x25.5cm). Tribute. "Mami", 2016. Ceramic and glass on wooden board, direct method (30.5x23cm). Playing with void to create the necklace, experimenting with pigments of different colour in the grout (grey, brown and black). "Frida", 2016. 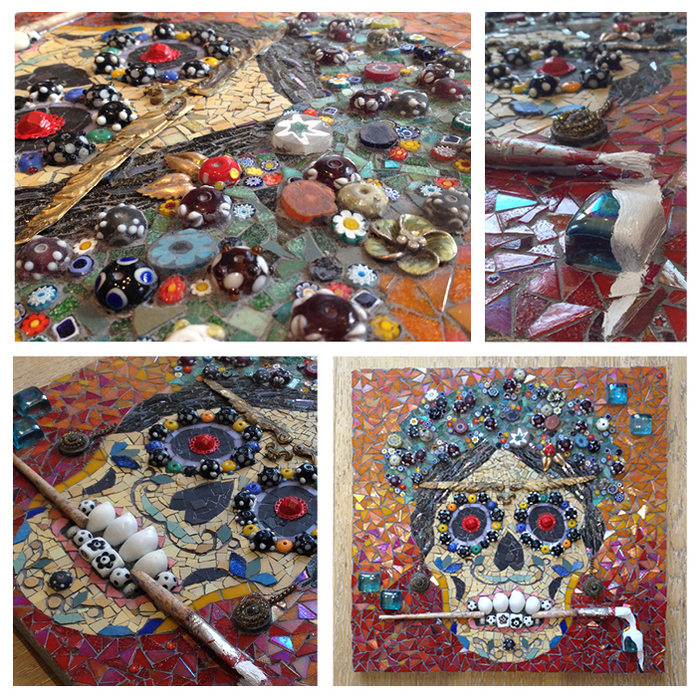 Mosaic and mixed media: ceramic, glass, millefiori, beads, shells, metal, paintbrush, paint on wood, direct method (40x40cm). Mostly made with recycled/upcycled material. Selected for the "Frida Kahlo – Lust for Life" Exhibition at the Menier Gallery, 51 Southwark Street, London SE1 1RU between 4 – 31 August 2016. 2016. 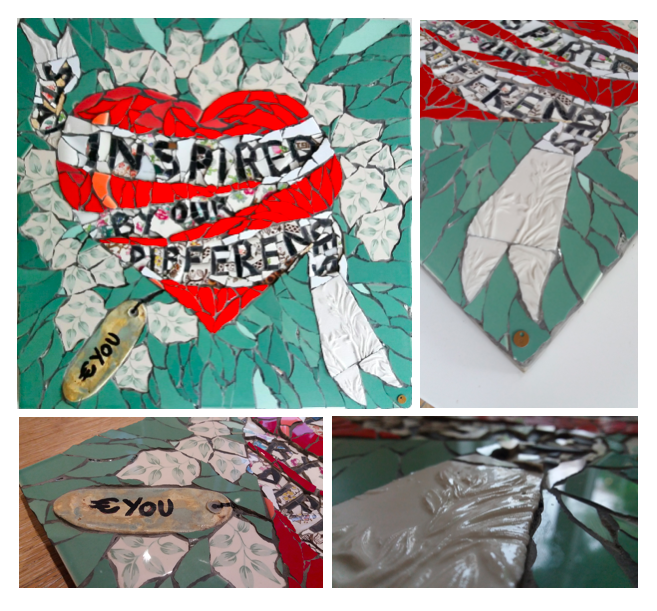 Ceramic, glass, marble, mirror, millefiori and pearl beads on wooden board, direct method on mesh (40x50cm). 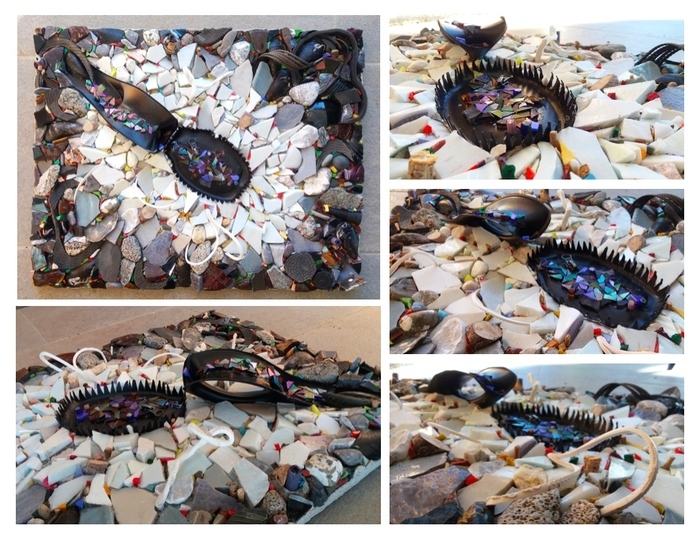 Mostly recycled/upcycled material. 2016: ceramic and glass on thin board, direct method (20 x 25cm). "Freddie", 2015. Ceramic, glass and cork on marmox, indirect method (35x35cm). Paying thorough attention to both colours and shapes of individual pieces and playing with geometrical shapes to recreate light and shades in the background. "Incy Lucky", 2016 - Ceramic, glass, marble and mirror on plywood, direct method (50x50cm). Opus sectile and opus Palladianum. Inspired by a tiny gold pendant my grandmother Iride had of a seven-legged spider, to which she always held on tight, even through both World Wars: possibly the only possession she managed to keep from her childhood… a spider which made me see her and love her for what she was, beyond her dignified and cold appearance. 2016. 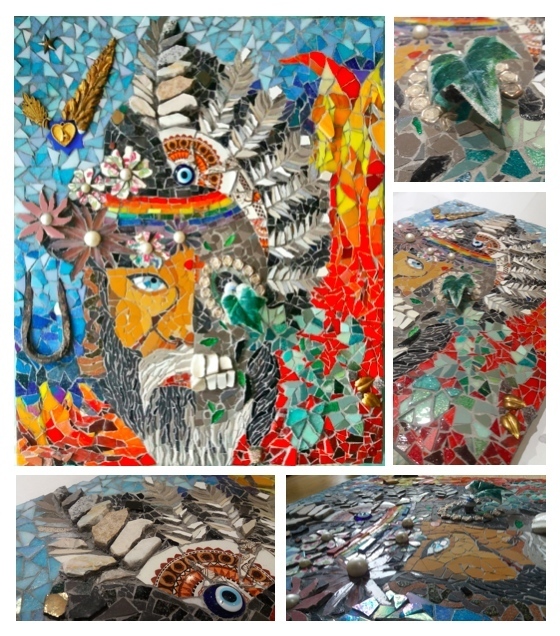 Glass, stained glass, ceramic, beads, millefiori, metal, and plastic on thin board, direct method (20x25.5cm). 2016. Drawing by Ettore (5). 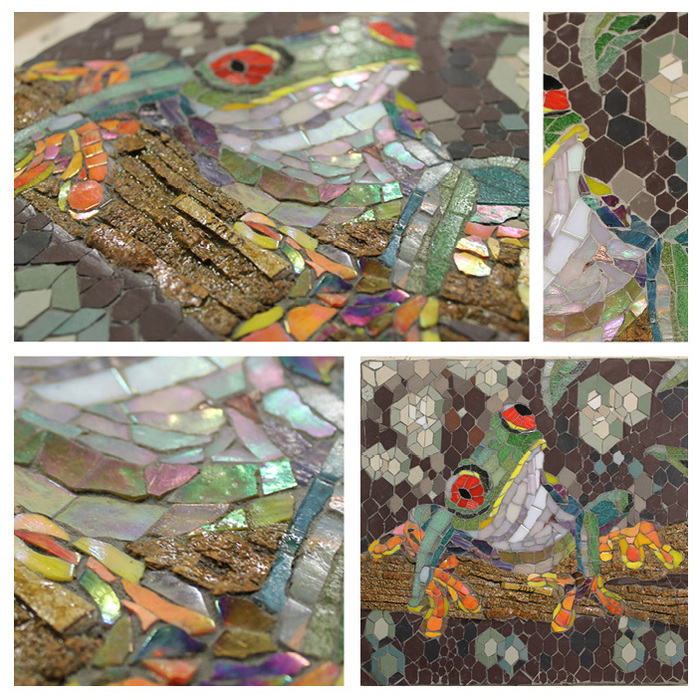 Ceramic, and glass on wooden board, direct method (37x37cm). 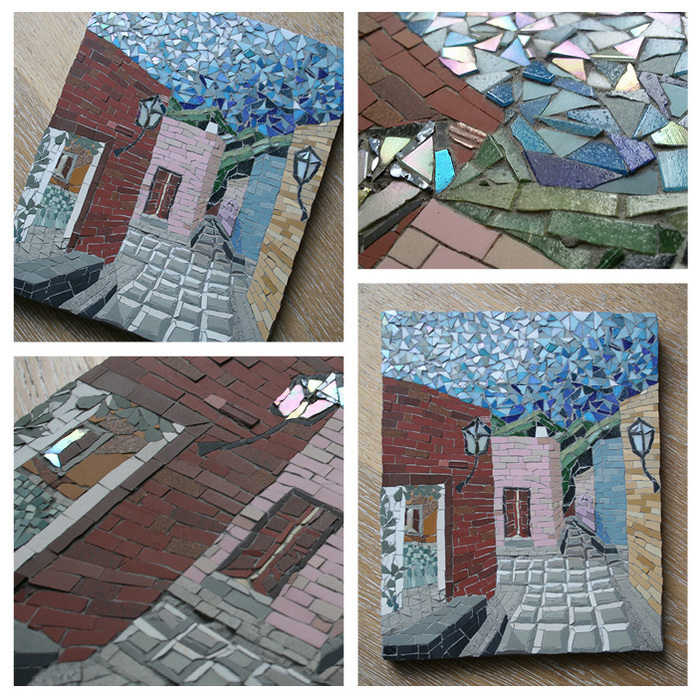 Mosaic & Mixed Media: ceramic, cork, plastic, glass and metal on wooden board, direct method (30.5x40.6cm). 95% reused material. Apparently, bees are decreasing at an alarming rate. If they go extinct, it is estimated that the human species would follow in 3 years. But, if we act now and let Nature be, it will grow back and heal itself, giving us ALL a chance to recover. Let us stop pesticides, pollute less, sow wild flowers…help the buzz BEe!!! 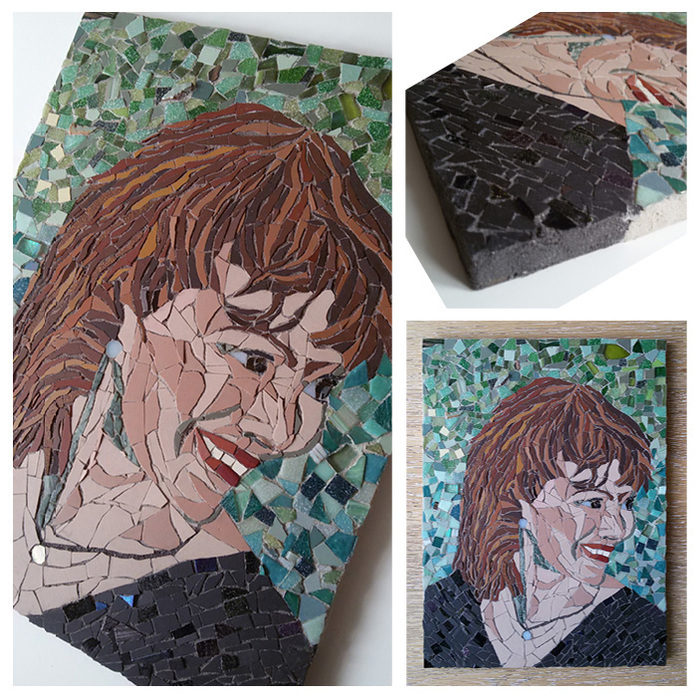 Mosaic & Mixed Media: ceramic, cork, plastic, glass and metal on wooden board, direct method (30.5x30.5cm). 50% reused material. Apparently, bees are decreasing at an alarming rate. If they go extinct, it is estimated that the human species would follow in 3 years. But, if we act now and let Nature be, it will grow back and heal itself, giving us ALL a chance to recover. Let us stop pesticides, pollute less, sow wild flowers…help the buzz BEe (and reclaim some space)! 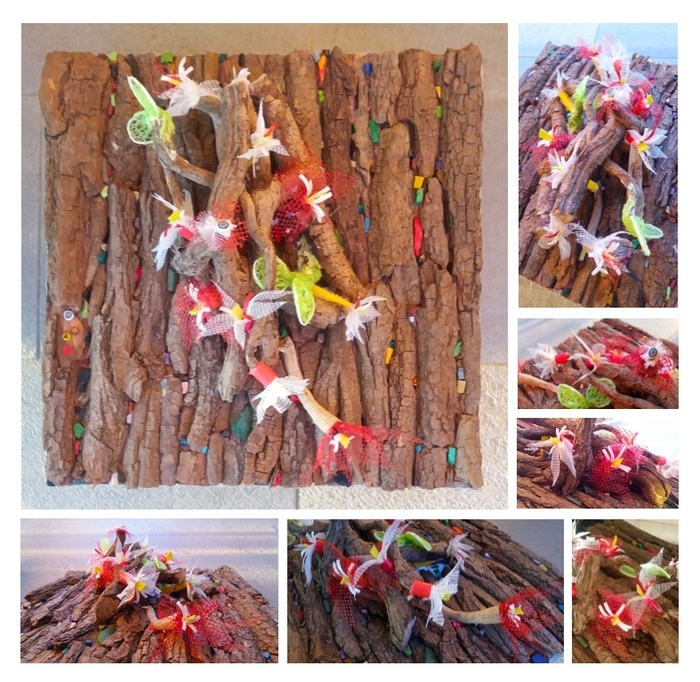 Mosaic and Mixed Media: ceramic, cork, bark, millefiori, metal and plastic on wooden board, direct method (22x22x30cm). 98% reused material. Apparently, bees are decreasing at an alarming rate. If they go extinct, it is estimated that the human species would follow in 3 years. But, if we act now and let Nature be, it will grow back and heal itself, giving us ALL a chance to recover. Let us stop pesticides, pollute less, sow wild flowers…help the buzz BEe (and reclaim some space)! 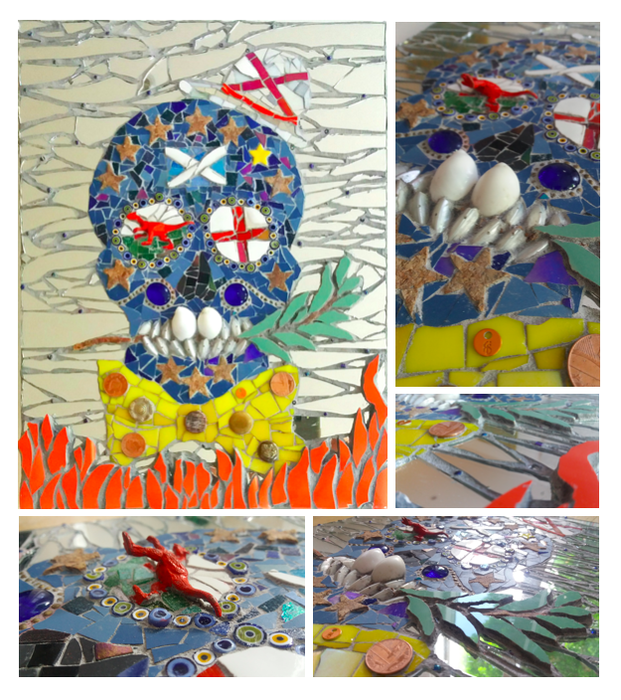 "San Cristobal", 2015 - Ceramic and glass on canvas, direct method (28x35cm). Opus sectile and opus tessellatum. "Keys", detail from Monreale, Sicily, 2016. Marble, smalti, gold, direct method (30x30cm). 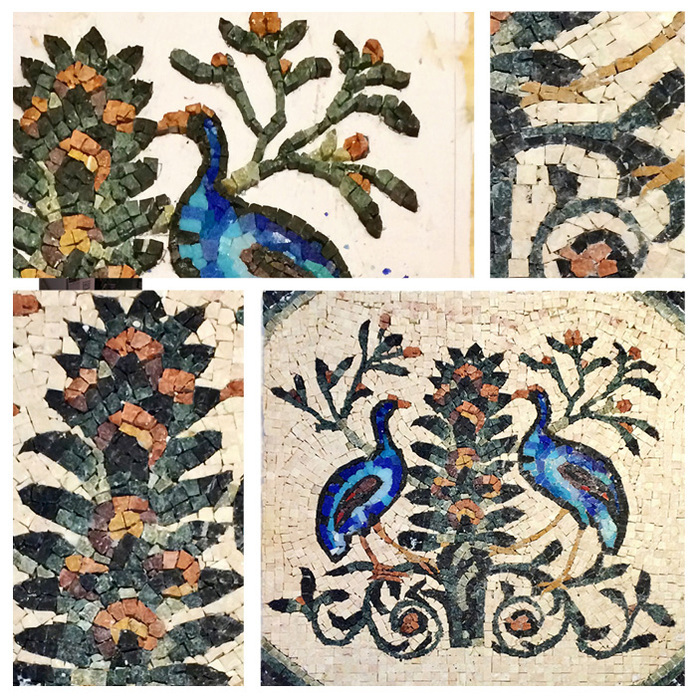 Course in Byzantine mosaic at Scuola Mosaicisti del Friuli, Spilimbergo, Italy. "Leaf 2", 2016. Marble and smalti on wood, direct method (30x30cm). Hammer & hardie. "Leaf", 2015. Marble and smalti on wood, direct method (30x30cm). Hammer & hardie. 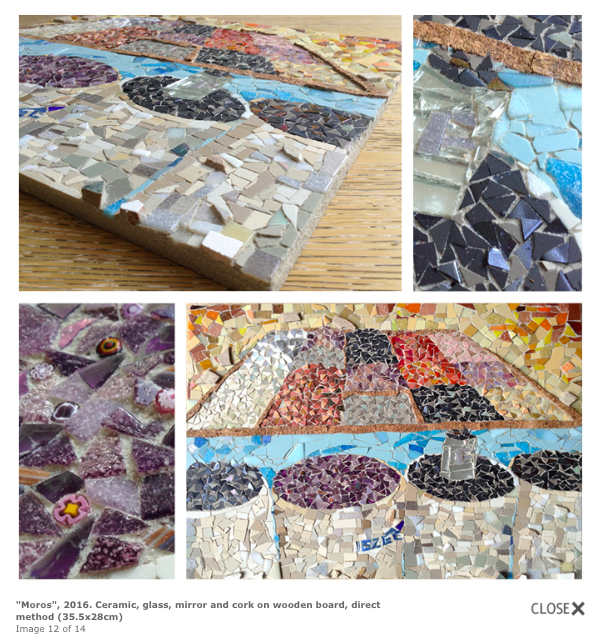 Mosaic & Mixed Media: crockery, wood, marble, glass, natural fibres and millefiori on wooden board, direct method (43x24.5 cm). 98% reused material. Did you know? In elegant, chaotic, amazing Naples there is a tradition whereby a customer can pay for a coffee for the next stranger who cannot afford it (“caffe’ sospeso”). Coffee is so essential, that no one should be left without it! "Positano, Made in Turkey", 2016. 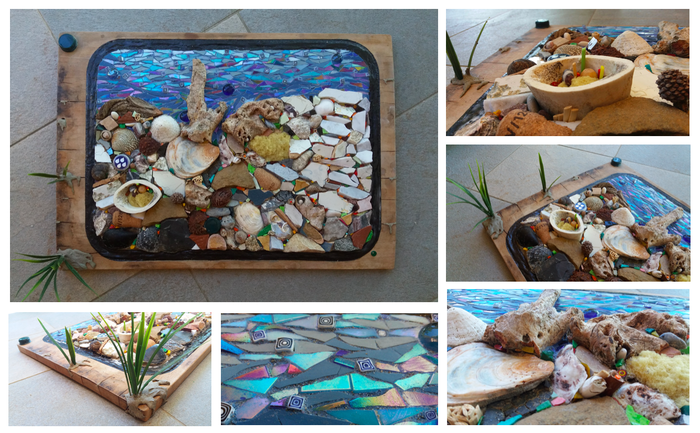 Glass, stained glass, ceramic, marble, mirror, plastic, pebbles, shells, cords and mesh on wood, direct method on mesh. 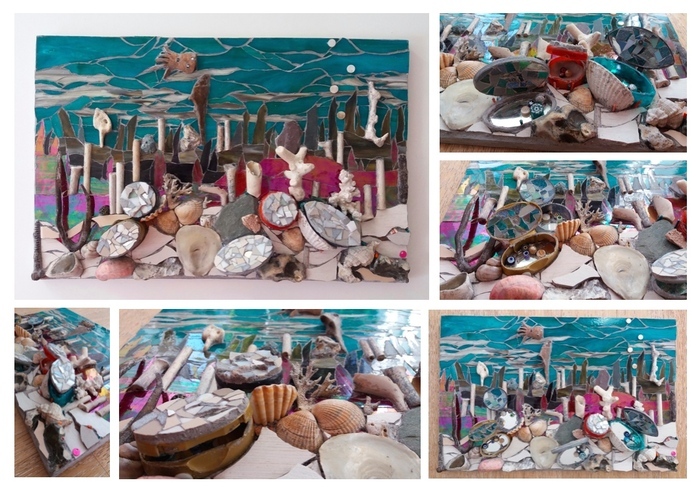 Ceramic, glass, XVI century pipes, metal, bone, coral, mother of pearl, shells, plastic, mirror, stones, beads and smalti on wooden board, direct method on mesh (48 x 31 cm). A post-apocalyptic vision of Earth: used, abused…and finally re-made, mostly with our own left-overs, to resemble the life that once was. 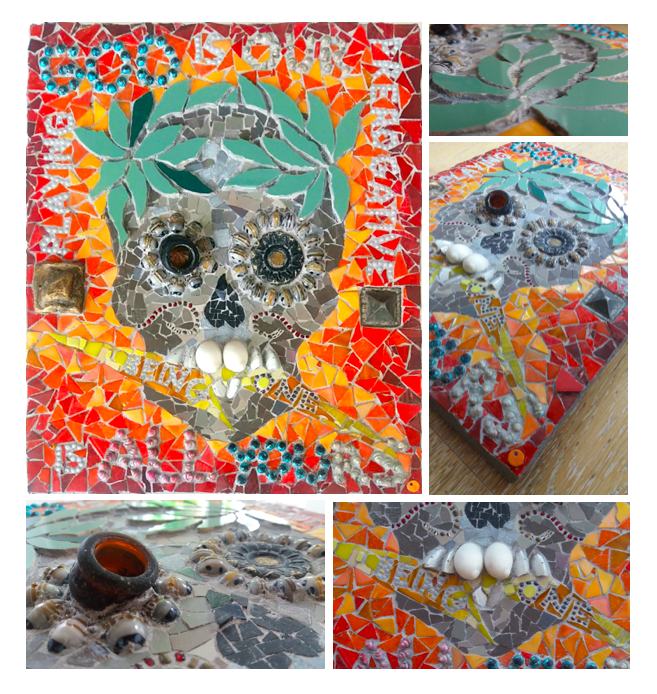 Ceramic, glass, mirror, bones, XVIc pipes, iron, fossil, stones, plastic and millefiori on wooden board, direct method (35x35cm). Made with the ‘treasures’ found mudlarking along the Thames, apparently now one of the cleanest metropolitan rivers in the world, but which used to be regarded as London's garbage bin. Thames mud is anaerobic and preserves whatever it consumes, which makes its shore one of the richest archaeological sites in the country. 98% re-used material. make you feel and think. IsayWe, 2016. A hymn to tolerance in times of fear. IsayWe are better together, IsayWe should agree to disagree, IsayWe should love our differences as they are an essential source of evolution. IsayWe are all the same in the end, IsayWe are all part of Nature and IsayWe should respect it all - earth to air, what lives beneath, between and beyond. 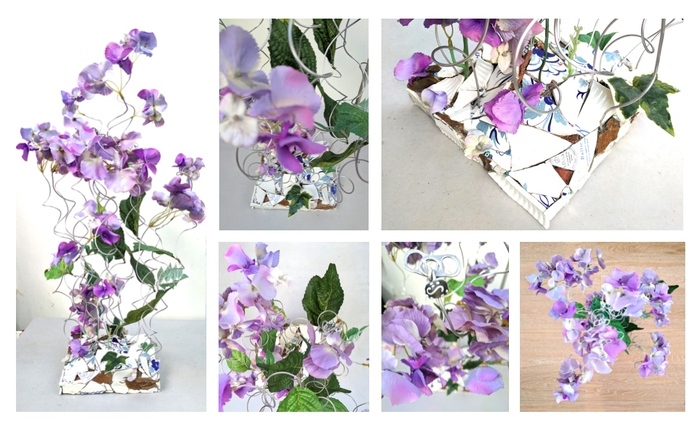 Ceramic, glass, marble, crockery, metal, plastic, and love on wooden board, direct method. 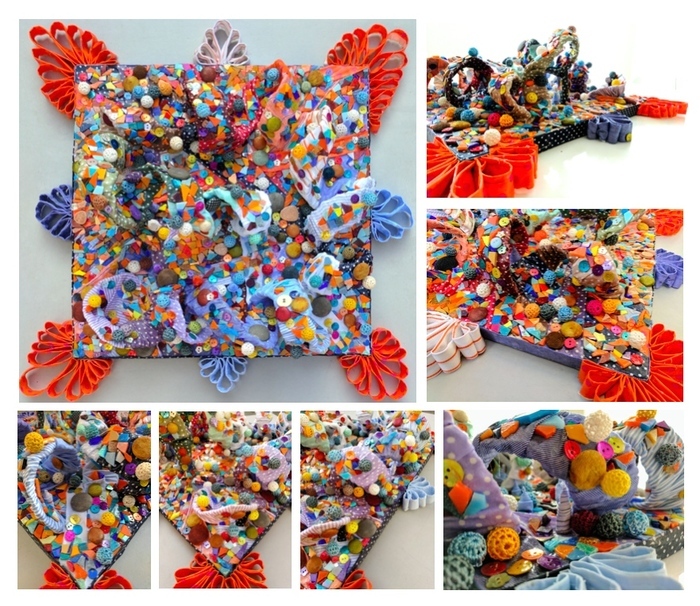 Mostly recycled/upcycled material (37.5 x 45 x 4cm). To a fascinating and bewildering beauty whose constant closeness to death pushed her to live her life with insatiable and unwavering curiosity. Hail Frida! 2016. 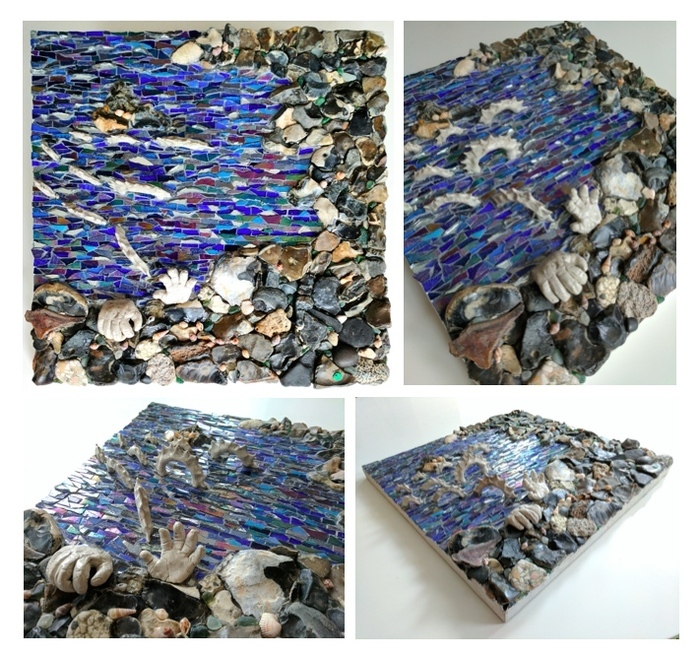 Ceramic, glass, shells, beads, metal, cork, coins and mirror on wooden board, direct method (30.5 x 40.6cm). I have been living in London as a EU citizen for 17 years. I come from Italy, yet I feel more British than most. I speak with little if no accent, thanks to my British friends. I took the citizenship test a few years ago, ready to apply for a UK passport. In view of the Brexit referendum, I felt very anxious about the increasing signs of intolerance around the world and the possibility of Brexit. I felt compelled to let this anxiety out by sending a message of unity and tolerance by as many means as possible. It did not work; I felt like I lost my home overnight, and quite angry both at how misled the campaign to leave seemed to be (in such a democratic country!!!) and how understated it possibly was within the London bubble. Moreover, my worry is not about my legal status, but also about the cultural impoverishment (at least because of the end of lots of EU funds and exchanges on education and research) the UK now faces. Nevertheless, I still love this Country - so I try to take it with humour (which is another 'great British feature') and send out a message of peace. 2016. 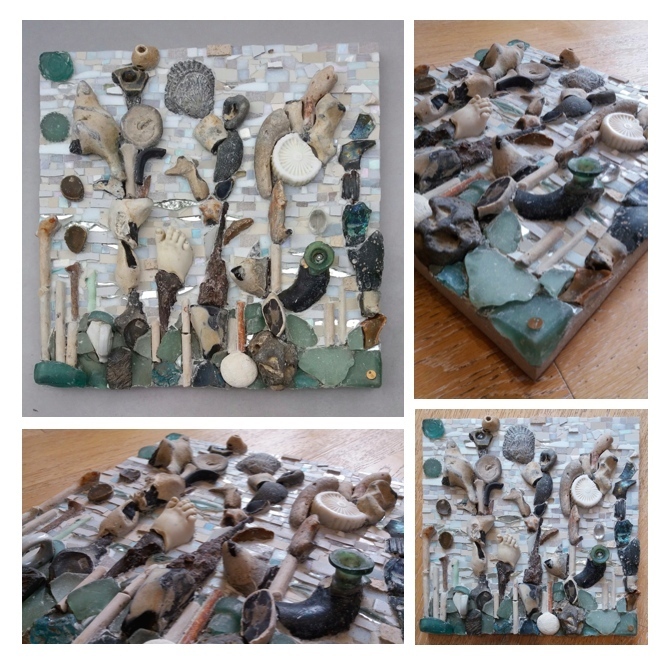 Ceramic, glass, beads, plastic, fossil on wooden board, direct method on mesh (30x41cm). A hand for help or hope? Who’s pulling who out of darkness? Or is light in the middle? Whichever way, a message of fraternity and humility - let us all aim for the light, be it love or knowledge, through an open heart and an open mind. Ceramic, glass, mirror and XVIc pipes on wood, direct method (28x28cm). 100% recycled material. Inspired by a sublime novel by Borges and drawings by Escher: how immortality devoidens life of a meaning. An initial feeling of omnipotence which pushes us to build incredible things, trying to defy the laws of Nature. And then in turn madness, frustration, resignation, boredom and regression. Why being immortal, when you are just a limited being? Endless time to do so little! Death is essential to our future. Our drive comes from savouring first times again and again and the knowledge that whatever we can do, we must do in the short span of our beautiful lifetime - and keep building on what was done before. Learn from our mistakes and our differences, then make it better, stronger, wiser. Think, feel, err, learn and evolve: do not only validate, but justify the immortality of our species. And this, our children, is the gift and burden we leave to you…with eternal love. Ceramic, glass, millefiori on wooden board, direct method (30.5x30.5cm). 99% re-used material. I like to believe that, at birth, a part of universal energy (white) gets encased in our limited body, and gains a particular consciousness (colours). When we die, this fragment of energy returns to its whole, which is everywhere anytime, contemporaneously encasing fragments in different beings, before and after the Big Bang, on Earth and elsewhere. The question which torments me is: does it retain any consciousness, any individuality? Any shape or dimension? And if we could choose, which fragment would you be? “Stick your Plastic up your Ars”, 2017. 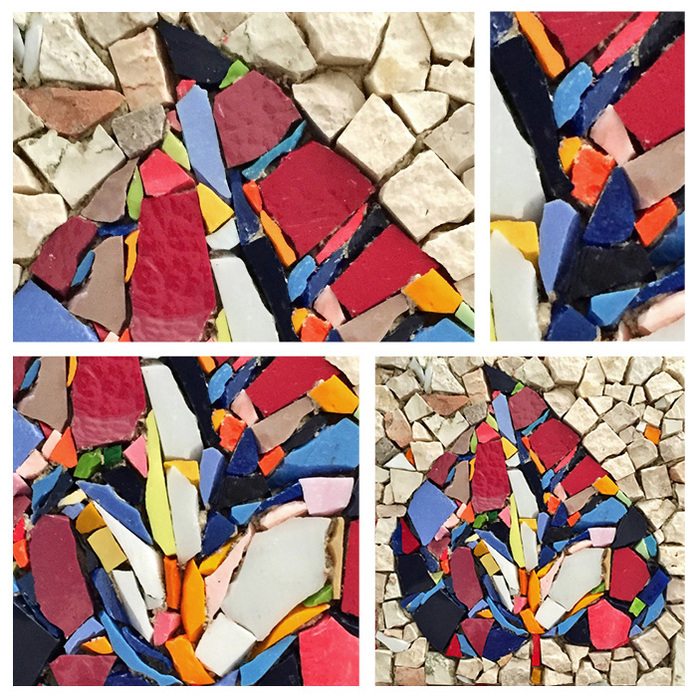 Mosaic and mixed media: bark, smalti, marble, millefiori, plastic (40.5x40.5cm). 98% reused material. 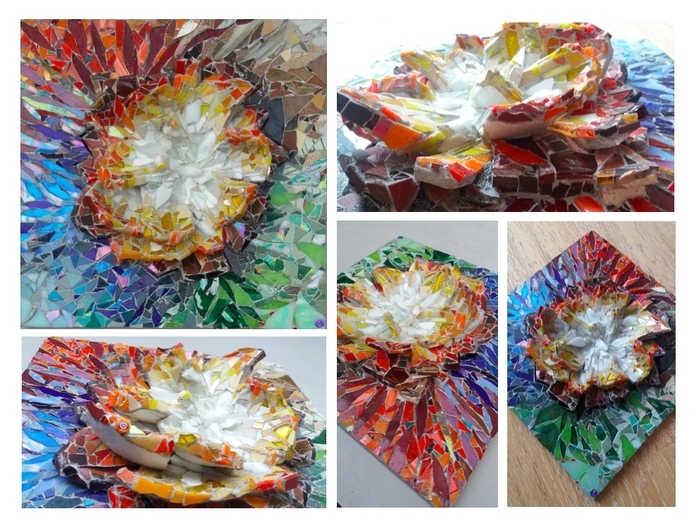 An example of how to upcycle disposable plastic leftovers. Plastic is quickly accumulating everywhere in our world and hardly dissolving, thereby dramatically contributing to the destruction of our ecosystem. But we CAN make a difference: SAY NO TO DISPOSABLE PLASTIC! 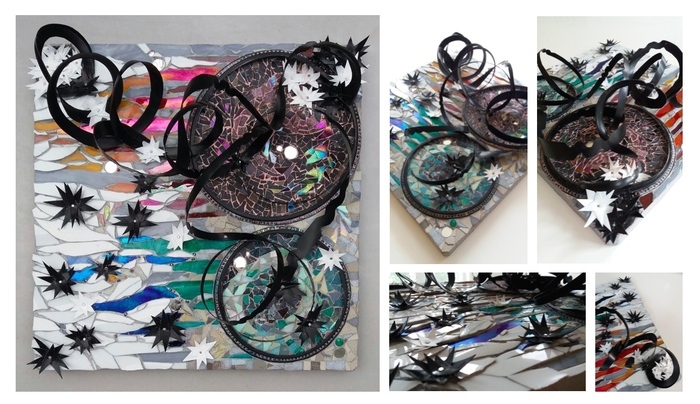 And in the meantime, why not reuse what of it is already there… and stick it up your art? 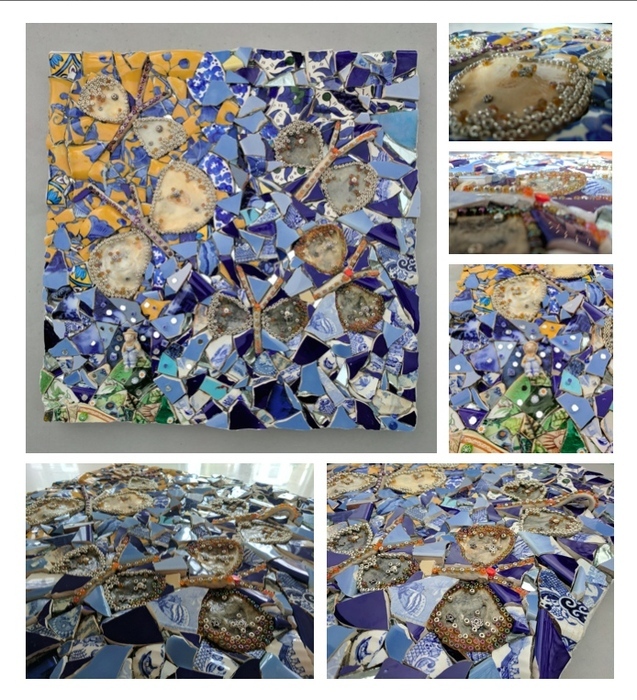 Mosaic & Mixed Media: ceramic, glass, mirror, XVI Century pipes, shells, beads & millefiori on wooden board, direct method (41x41cm). 85% reused material. Ever felt the feeling? Wanting to grab others by their shoulders to make them see the sun going down, but only to see instead what a lunatic you are in their eyes, and retreat? Perhaps it is time to close our devices and open our minds, disconnect from our screens and reconnect with nature, look beyond and climb on that hill. Let us all be Fools, and keep each other company on that hill. We could check if it is true that the sun is not setting where it used to… Shall we? “Matter, Anti-Matter (The AntiMatter Mistery)”, 2016. 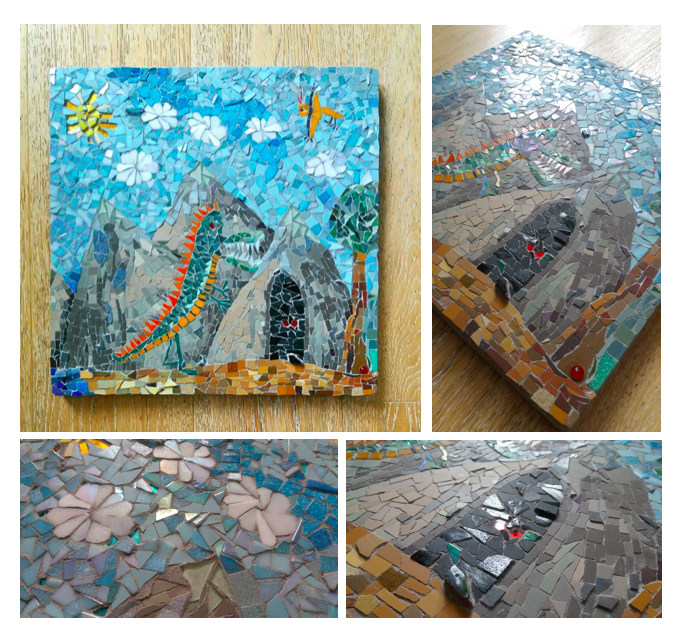 Mosaic and Mixed Media: smalti, marble, pebbles, plastic, metal, wood and millefiori on wooden board, direct method (40x40cm). A recent experiment at Cern with equal amounts of hydrogen and anti-hydrogen confirmed how, when they come in contact, they annihilate each other and create pure energy. Yet some matter remains (confirming the matter - antimatter asymmetry problem). I find this fascinating: we are so scared of our anthithesis, whilst in fact - at least in our world - it should be the other way around: the black beast is indeed the Matter, eating away the beam of anti-hydrogen. Like Matter, like Man - toward anything in our way? “Birth, Re-”, 2016. Ceramic, glass, millefiori on wooden board, direct method (30.5x30.5cm). 99% re-used material. I like to believe that, at birth, a part of universal energy (white) gets encased in our limited body, and gains a particular consciousness (colours). When we die, this fragment of energy returns to its whole, which is everywhere anytime, contemporaneously encasing fragments in different beings, before and after the Big Bang, on Earth and elsewhere. The question which torments me is: does it retain any consciousness, any individuality? Any shape or dimension? And if we could choose, which fragment would you be? 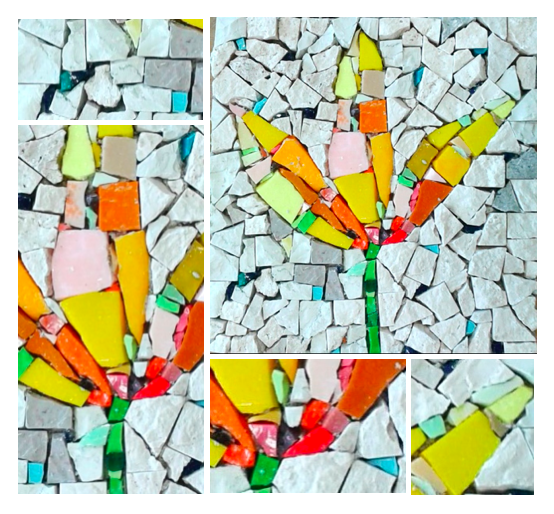 Mosaic and Mixed Media: smalti, marble, pebbles, plastic, metal, wood, glass and millefiori on wooden board, direct method (40x51cm). Experiments with equal amounts of matter and antimatter confirmed how, when they come in contact, they annihilate each other and create pure energy. Yet some matter remains (confirming the matter - antimatter asymmetry problem). Fascinating. We are so scared of our anthithesis, whilst in fact - at least in our world - it should be the other way around: the black jaws are indeed the Matter, eating away the Antimatter. Is this what a black hole looks like, seen from the other side? 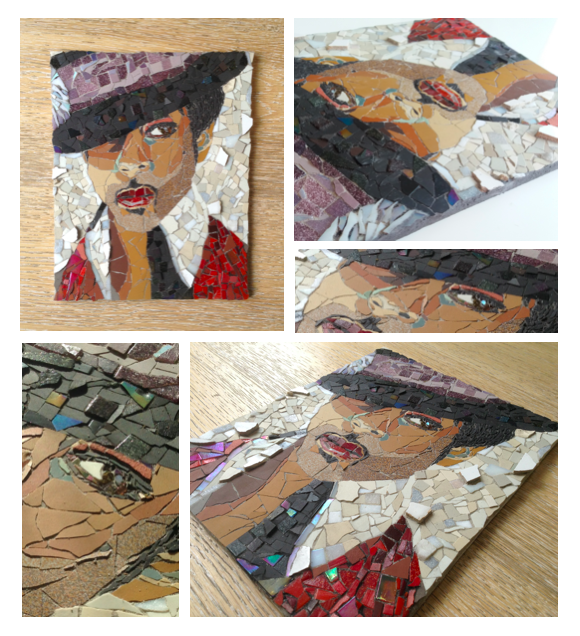 Mosaic and mixed media: fabric, plastic, glass, ceramic and mirror on wood and metallic mesh (53x55cm). 70% reused material. Pure exuberance: like the lyric poet Pindar with his magnificently articulated words, which made emotions detach from their two dimensional form and come alive in the reader’s mind, so I am frantically trying with colours to detach and jump at the viewer’s mood…I might as well have called it “Folly”. Is it getting to you? “Complementarity”, 2017. 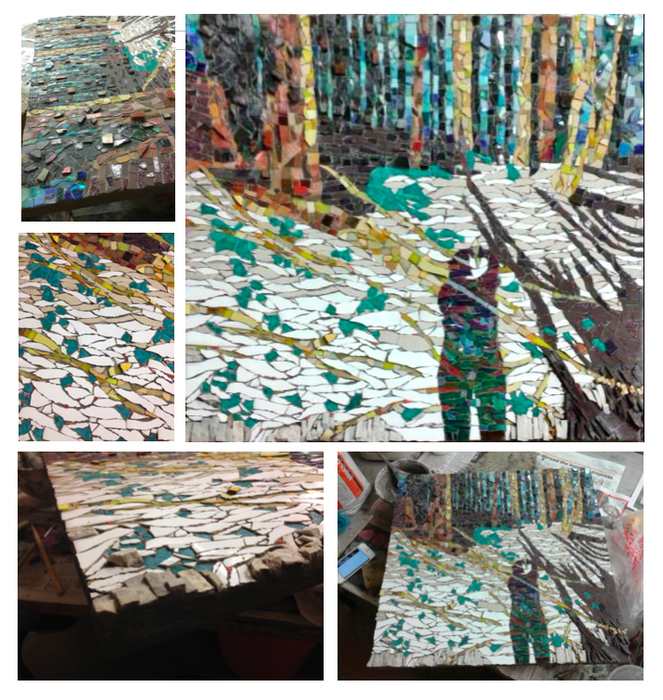 Mosaic: fabric on wood (30x30cm). 100% reused material. Your old shirts in a new pattern, trying to be as logic as you are. You are the Hence, and I am the But. You are the lines and I am the dots. You think and I feel, you feel and I do. I say…a world can really be made by two. 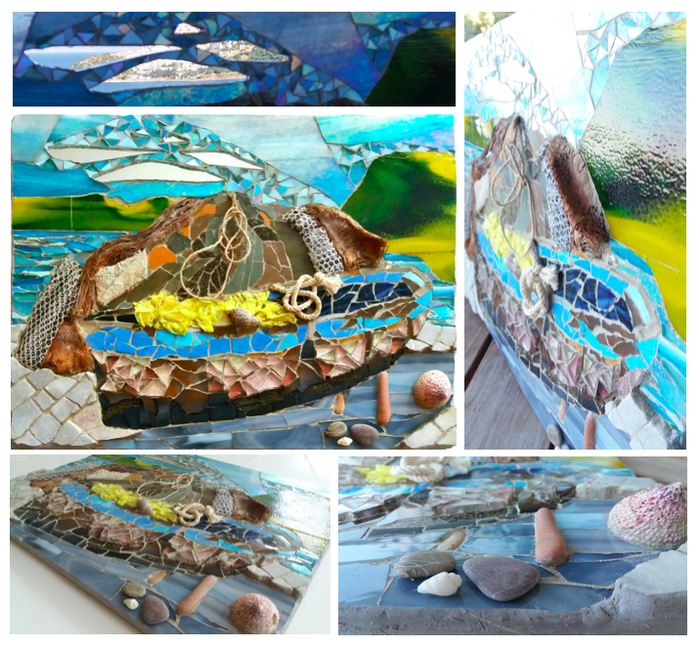 Mosaic & Mixed Media: ceramic, glass, mirror, XVI century pipes, plastic, fabric and metal on wooden board, direct method (37x36.5cm). An oxymoron: reproducing life in its artificial nemesis. 100% reused material. Ceramic, glass, XVI century pipes, fabric, metal, mother of pearl and plastic on wooden board, direct method (30.5x41cm). Hopefully, a good example of how upcycling can turn old material into something useful, fun and even beautiful…and a subtle tribute to Matisse's defiance to the traditional use of red and blue (by using blue as a foreground, and red as a background). Merci Henri!! 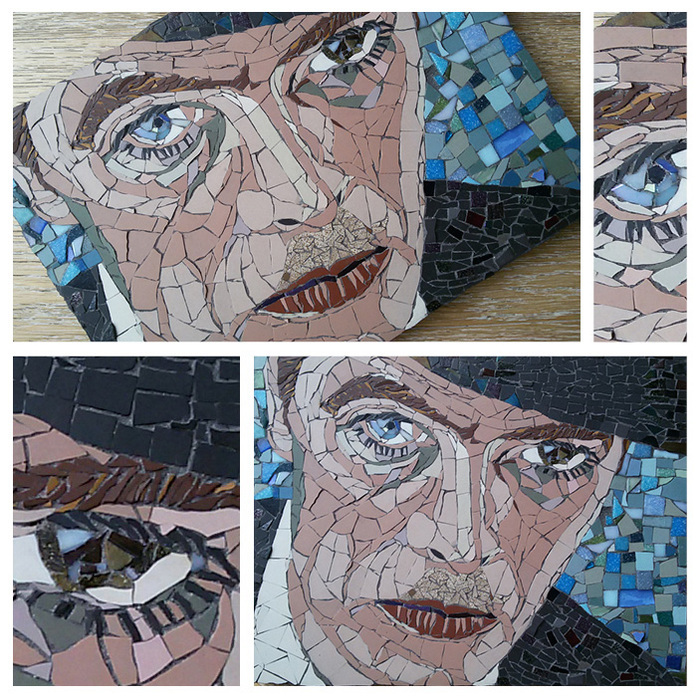 Mosaic & Mixed Media: ceramic, cork, plastic, glass and metal on wooden board, direct method (30.5x30.5cm). 50% reused material. Apparently, bees are decreasing at an alarming rate. If they go extinct, it is estimated that the human species would follow in 3 years. But, if we act now and let Nature be, it will grow back and heal itself, giving us ALL a chance to recover. Let us stop pesticides, pollute less, sow wild flowers…help the buzz BEe (and reclaim some space)!! !